It is the hunting season again. Many films out there are keenly angling for the prey - the Oscars. Which film will successfully hunt them down is yet to be seen, but we could engage in the fun game of seeing what strategies each film is adopting. Some films do it by being great cinema, and some others bait. Often the baiting is so obvious, we may as well call it the baiting season. And this year's most accomplished baiting is perhaps achieved in The Revenant. The Revenant is simultaneously baiting for two big Oscars. The Best Film, of course, but also The Best Actor. At this point of time, Leonardo DiCaprio's Oscar has become a public issue where everybody has an opinion, whether for or against, and very few people seem to realize it is quite a pointless exercise. The Oscar is fickle prey, and DiCaprio is no victim. He is, anyway, living a life that most of us couldn't even dream of. Getting back to the movie though, the plot is a portmanteau of a survival subplot and a revenge subplot. 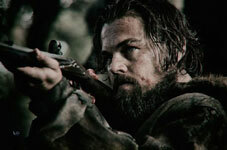 You're possibly aware that it is based on the true story of Hugh Glass (DiCaprio), a fur trapper and a frontiersman who got almost fatally mauled by a Grizzly bear and was thus severely incapacitated. His fur-trapping party which was escaping from a brutal attack by the native tribesmen and fleeing to the American camp leaves him in the care of Fitzgerald (Tom Hardy) and Bridger (Will Poulter) under express instructions to give him a proper burial when he dies. Fitzgerald and Bridger abandon Glass, though, and set off to the camp themselves claiming that Glass is dead and was given a Christian funeral. Glass, however, being made of a much tougher fiber, survives, drags himself through 200 miles of wilderness, and even tracks down Fitz and Bridger to exact revenge for his abandonment. These two paragraphs above give you an idea of what actually happened. But the abandoning doesn't seem like a good enough reason to exact revenge. At least not a noble enough reason (because you need to have nobility to wink at the Academy). So what the film does is insert a gratuitous subplot of Fitzgerald murdering off Glass' son right in front of him. So now he's surviving to avenge his son, which sounds better than sulking for being dumped by the squad. The baiting continues. Hugh Glass (in reality) finally wouldn't exact revenge on Fitzgerald and Bridger because they re-enlist in the Army, and there are very high penalties for killing a soldier. Perfectly practical reasons. About as noble as wanting to kill the guys who left you to die. But, of course, the film can't have DiCaprio backing out for such paltry reasons. So it gives the character some more nobility of reflecting on how revenge is a contemptible companion. This manipulation becomes very obvious and can get embarrassing. Hugh Glass is made out to be a perfect paragon of honour and integrity while Fitzgerald is utterly despicable. For a film (and a maker) that loves to appear meditative on the topic of human nature, this black-and-white approach is a glaring blunder. Now take this manipulative mess and give it the masterly direction of Alejandro Gonzalez Innaritu, and you'll comprehend the definition of vacillation. You just can't decide what to make of the film. It is a base movie in many respects. Ordinary survival and revenge story made worse by unnecessary heavy-handedness. But... but... Alejandro Innaritu makes it look like something you've never seen before. When the natives attack the Americans you can't help feeling like the action is happening around you. All the wizardry he demonstrated in last year's Birdman is still there, if not a tad more awesome. It is particularly evident in the scene of the Grizzly Bear attack. The attack is unnerving in terms of content itself, and then Innaritu places you at the very epicentre of all this gruesome activity. Each thump, each clutch is felt with genuine bewilderment. The visuals are among the most impactful things you'll see in a while. A fire is shown by the flying embers against the backdrop of a dark cold night's sky. There are multiple shots from the ground of trees climbing into the sky which echo a certain emptiness in all directions. Hugh Glass often dreams up his dead wife, and there is a particularly spellbinding one with him kissing her as she hovers in the air. Innaritu is still a master, if only a misguided one. But we can't forget the real reason why The Revenant is such a big film. The big star, of course. DiCaprio grows long hair and beard. 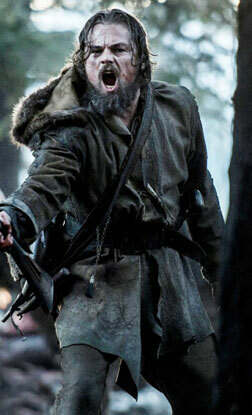 DiCaprio survives in sub-zero temperatures. DiCaprio catches and eats raw fish. DiCaprio eats raw Bison liver. DiCaprio spent months away from hot supermodels for this role. Oh, give him an Oscar and give us a break already! DiCaprio's may be an effortful and even masterful performance, but it isn't a great one. Just like how the film is effortfully and masterfully made but will not be remembered or even re-watched after the hype dies down. What's missing, we can't easily articulate. We can't give it a name. But we can tell you where to look for it - Tom Hardy's performance. You take a moment and contrast DiCaprio's performance with Hardy's, and you'll get an idea of what we are going on about. Hardy probably didn't eat Bison liver or sleep in a horse's body, but he doesn't give you a chance to think of Tom Hardy when he's playing Fitzgerald. When you see DiCaprio on screen, you're already overcome by all that publicity of his strenuous efforts that you don't for a moment imagine that it is anyone else. DiCaprio can whip up some star admiration, perhaps, but he doesn't get you to worry for Hugh Glass as much as Hardy gets you to loathe Fitzgerald. Indeed, when the star and the director are feted for all the efforts put in and all the cool things they do for a movie, that makes it a lot like celebrating a chef who wins a Guinness world record for making the largest cake ever. Painstaking? Yes. Requires craft? Yes. But shouldn't the question be, is it tasty? I think you are not alone in thinking that the lead actor actually does not deserve the best actor award. Here is a link to BBC, where they have analysed the success of the movie. The thing is, Madhu, at some point one begins to catch on to the fact that a Best so-and-so Oscar isn't exactly given to the best so-and-so. My moment of realisation came when Inglourious Basterds didn't win the Best Original Screenplay Oscar (I personally feel that stuff can have a couple of PhD theses made on it). Or when The Shawshank Redemption didn't win the Best Film. The trouble isn't that the good work is losing but that people covet this award so much that they start working outside their zone. I've been a fan of Innaritu right from the time I saw Amores Perros. Babel, and Birdman were both amazing, too. The complexity and sensitivity this man is capable of is marvellous. Yet, he makes this black-and-white, hero-villain revenge story which doesn't really demand his skills. What's more, he fabricates it himself from a much different real incident. I attribute this to a want of external glory as opposed to internal satisfaction and the Oscars embody this glory. I understand we weren't talking about Innaritu or the Oscars but I suspect you may glean a point or two from my comment which are relevant to the prevailing discussion. And who are you?? Who appointed you as the class monitor? Everybody has a right to post and my post was addressed to the reviewer. So, cool it. And Leo won his Oscar hhahaaha!! fullhyd.com has 700,000+ monthly visits. Tell Hyderabad what you feel about The Revenant!